It's been a couple months since Geronimo! 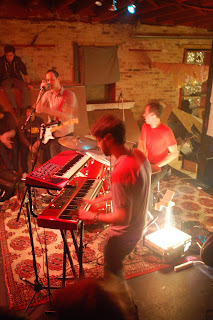 last sandpapered our brainstems with their gritty, amped-up space rock. In this new video for the thunderous single "Into the Sun," the band enjoy a pretty sweet thrifting session in between Halloween-lit basement jams. The trio will be returning with their sophomore LP Exanimate on October 5th, the follow-up to their fantastic debut Fuzzy Dreams. Keep an eye out for them in New York next month too, when they play the Exploding In Sound/GIMME TINNITUS CMJ Party at Paper Box in East Williamsburg on October 20th. Good things on the horizon all around for these loud locals. Watch the new video (which was directed by John Ugolini) below.